Having snapped my shot at the start of the run, I headed north, beginning my climb. One of my favorite things about running in the spring is how curiosities obscured by the cover of summer become readily apparent before the vegetation leafs out. 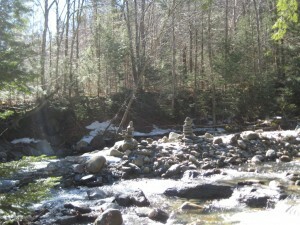 This run was no exception – as I approached the developed picnic area on the left, I noticed some well built rock cairns in the midst of the stream bed. This was surprising, as during most winters these ephemeral sculptures are wiped out by the ice and spring runoff. I have often thought it would be fun to make one of these, with spray paint on the rocks to make the cairns look like a stack of jelly beans. Maybe this year? After about a half mile on the road, I reached the point where the forest service road is blocked to traffic, and kept open only for snowmobilers and skiers for the winter months. The gate was open, however, although I saw little evidence that the road above this point had gathered much interest from the March drivers, although I suspect it is easily passable by passenger cars. I did see a sign that one of the resident moose, probably on the young or small size, had chosen the path of least resistance on its way down the mountain not long before I passed through. 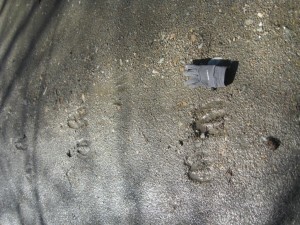 I could tell the moose must be a well-informed runner, as the tracks seemed to stay on the crest of the road, right down the middle. I learned the hard way 20 years ago, that running consistently on the left side of our highly “bowed” dirt roads in Vermont can lead to one hell of a case of IT Band tendonitis. 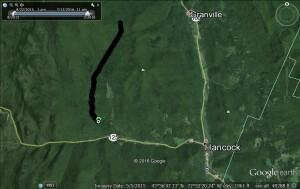 At this point, the main road, which I have run frequently, veers to the right to its conclusion in about .25 miles. The aforementioned snowmobile continues in a direct straight(north) line from here, and it was almost as bare of snow as the prior forest service road had been. In fact, at the higher altitude, the ground was still well frozen making for an excellent running surface – not nearly as muddy as I expected it to be. From this point, it was an easy-to-follow run on a double track primitive road, most definitely not suitable to car traffic, although signs of recent tree harvesting was apparent, indicating that they had gotten some pretty heavy equipment up this route. In a short while, the icy snow pack on the trail got challenging enough under foot that I stopped and slipped on my “Microspikes” over my running shoes, more for peace of mind than anything, and kept these on for the last mile of my uphill run, and the first mile of the descent. 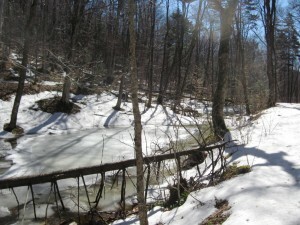 At 3.5 miles into the run, I reached the height of land on this trail, and at this highest altitude (about 2200 ft) there was considerably more snow, and a few ice-bound ponds alongside the trail. Hi there! Thanks for writing & publishing these helpful posts about running in and around Middlebury. I’m going to be in town this coming weekend, and need to get in 4 or 5 hours of running on Saturday. What might you recommend? Do you know whether the Trail Around Middlebury is ok at this point, or is it a total mud fest? I would really like to get a long run in, but I don’t want to contribute to the awful erosion that happens when you tear up a muddy trail, and it sounds like there’s not enough snow for snowshoeing this year. I realize I may need to do multiple loops of something, in order to spend that much time on a trail, but let me know what you think. Thanks! Glad you like the blog Ashley. There is basically no natural snow left, so don’t even think about that. I did a few chunks of the TAM last week, and it was surprisingly dry. I don’t think you would be irresponsible running on it in it’s current condition. With a time commitment like you have, you could definitely make it once around and do a partial second loop. 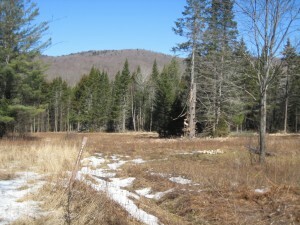 I haven’t been on any of the trails up in Ripton yet this spring, but I suspect that they wouldn’t be bad either, given what I saw on Saturday on the snowier western side of Midd Gap. 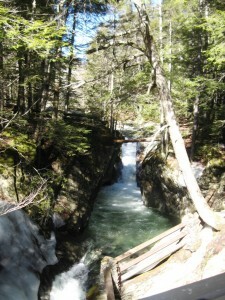 I don’t think the water will be high at any stream crossing either, given the paucity of spring snowmelt, so you might also consider running around Lake Dunmore (road) combined with the lower elevation Moosalamoo trails. Great! Thanks so much for these tips, & happy running! Just to close the loop, Jeff, I had a fun run on Saturday, doing an out & back from the Chatfield parking area. I ran all the way down the dirt maintenance road up to the Long Trail, then headed south on the Long Trail for a while til I ran out of time. About 16 mi total. Trails were mostly clear and dry, with the only slightly time-consuming part being a stream crossing just before reaching the Sucker Brook shelter; I walked up & down the edge of the creek a few times before figuring out a good way to cross (the water was running high and all the rocks that otherwise would’ve been useful stepping stones had a film of ice covering them.) All in all, a fun morning. Thanks for the local info!! Glad you had a good run – the Chatfield lot is a great access point!